Interference Archive | This is an Emergency! Reproductive rights and gender justice are in a state of emergency right now. In the past few months alone we’ve protested against the insane anti-abortion legislation being passed in Texas and North Carolina, and we’ve demanded for justice for the devastating violence perpetrated against transgender folks in NYC, Russia, and Jamaica. 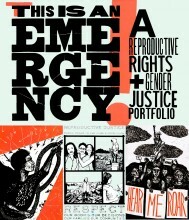 Interference Archive presents This is an Emergency!, a project curated and organized by Meredith Stern and Molly Fair in response to the continuous attacks on reproductive rights and gender justice. It brings together the voices of those most affected by these issues: women, queer identified, and transgender folks, through a portfolio of prints created by 17 artists, and a zine of interviews with mentor activists. This exhibition is a call to action- to defend our rights to make our own choices about our bodies and lives, to cultivate healthy and supportive communities, and to fight against systemic oppression. Participating artists: Melanie Cervantes, Thea Gahr, Bec Young, Favianna Rodriguez, Mary Tremonte, Molly Fair, Meredith Stern, Erin Rosenthal, Ian Cozzens, Kristina Brown, Delia Kovac, Emmy Bright, Lois Harada, Katrina Silander Clark, Arley Rose Torsone, Sam Merritt, Olivia Horvath, and Susan Simensky Bietila. Interviews with: Judy Kashoff, Gina Glantz, Peg Johnston of the Abortion Conversation Project, Heather Booth and Judith Arcana of Jane Abortion Collective, composer Ken Rinker, Virginia Reath, and Elizabeth Esris.